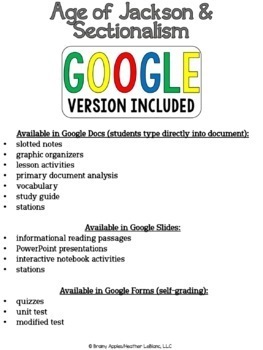 This item is a comprehensive CURRICULAR UNIT (GOOGLE version included!) 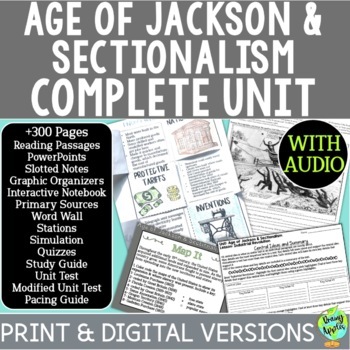 about the Age of Jackson & Sectionalism that integrates reading and literacy. There are 5 complete lessons included in this bundle PLUS supplemental activities. This unit includes about 6 weeks of materials. I will be adding an audio of each passage soon! • 5 slotted notes pages so students can focus on recording the important information from the PowerPoint presentations (which includes carefully curated videos & links that will enrich the lessons) Editable slotted notes included! 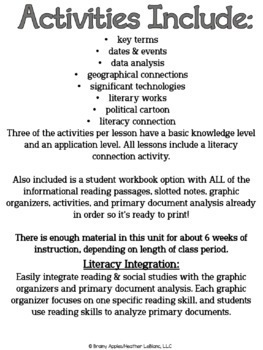 • 20 activities (4 per lesson) (key terms, dates & events, data analysis, political cartoon, geographical connection, significant technologies, literary works, and a literacy connection) per lesson. Three of the four activities PER lesson have two levels: a basic recall and an application of knowledge. Specific reading skills in this unit are: citing text & making inferences; relationships in a text/cause & effect; unknown words & phrases; text structure; and central ideas & summary. You will be easily integrating reading with your social studies content because the 5 graphic organizers focus on one specific reading skill per organizer, AND students will be analyzing primary documents. 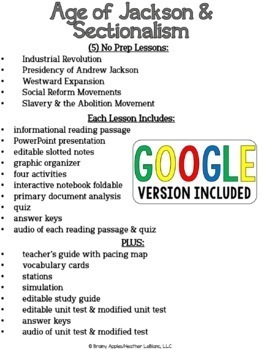 If you have purchased any of my NO PREP Age of Jackson & Sectionalism lessons, please email me if you are unsure of what additional materials this unit includes.